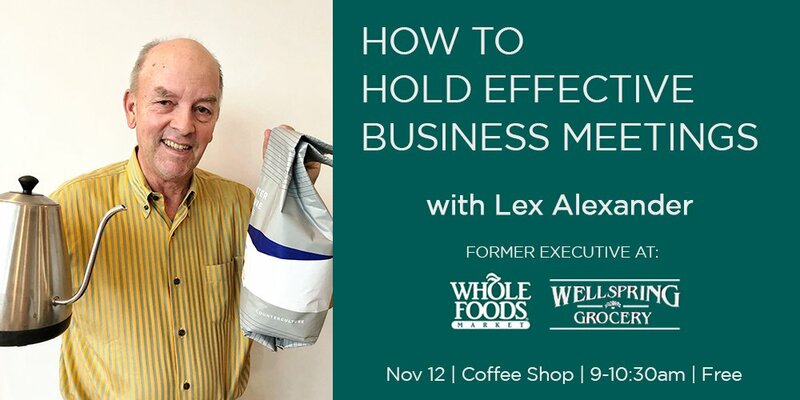 Join Lex Alexander in the coffee shop for his latest class on holding effective business meetings. Lex will highlight his personal tips and tricks, drawing on his many years of experience first at Triangle-based Wellspring Grocery and later at the international Whole Foods Market. Enjoy a cup of our locally-roasted Counter Culture coffee as you listen to his stories, absorb his advice, and get to know other local business owners and entrepreneurial spirits. I started Wellspring Grocery in 1981 with my wife Ann. We ran the business and grew to one store in Durham, one in Chapel Hill, and one planned in Raleigh. We sold the business to Whole Foods in 1991, and I became a part of the executive team running Whole Foods. In the same way there was someone focused on IT and HR, operations, and accounting, my job was the food. They called me ‘The Food Guy’. When I joined, there were under 15 stores – doing about $140 million in sales per year. When I left the company, there were over 100 stores and the sales were over $2 billion. If someone were to ask me how we did it, one of the things I would mention in my answer is that we ran really effective meetings. I’ve come up with the fundamentals of these meetings, and have put them together in a class. This hour-long class is a combination of conversation, stories and lessons to learn, with a short Q&A at the end.